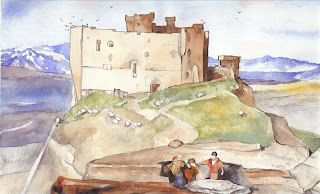 This is my interpretation of John Sell Cotman's watercolor, "Harlech Castle," which I painted for the June landscape project on the Following the Masters website. I scanned it, but my scanner bed is a little smaller than the painting (in fact Mr. Cotman's original is smaller, too) so a very little bit is cut off of each side of my painting. I like the puffy little sheep on the hillside-such a common sight in the British Isles. I looked it up, and learned that the castle is in Wales and was built in 1283. The challenge now is to post the painting on Following the Masters...I may need to call in help for that task! Love it! So glad you have a blog!